In honor of day one and round one of the 2018 NHL Entry Draft: a list of firsts (specifically the draft-related kind). The first NHL Draft pick in team history. Picture this: It’s June 24, 2006. General Motors Place in Vancouver, BC. To some, it’s just another day. 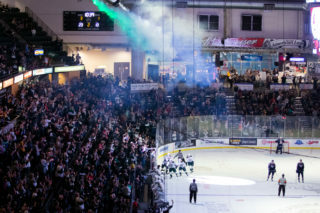 For Silvertips Country and the entire franchise, it’s history in the making. Why? 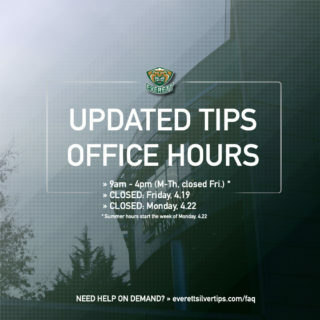 Because Silvertips forward Peter Mueller is about to be drafted into the NHL, making him the first draft pick in franchise history. Round one, pick seven. The One and Only Wayne Gretzky walks to the podium and announces, “The Phoenix Coyotes are proud to select, from Everett of the Western Hockey League, Peter Mueller.” An entire section full of Tips fans explodes into a wild roar as 18-year-old Muller makes his way to the stage. 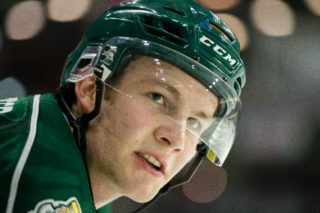 The first of many, he paved the way for all future Silvertips players to come, proving that their potentials are endless. Our first #NHLDraft pick in Tips history had his name called by Wayne Gretzky. The one that was almost first. Ryan Murray. The breakout defenseman from White City, Sask. 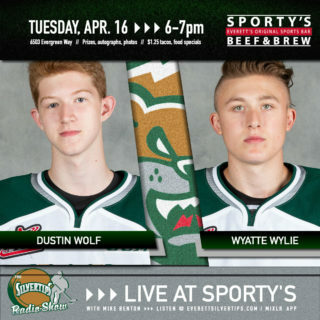 had 121 points in his Silvertips career. In his first three years, he had 104 points (20 goals, 84 assists), making him a pillar on the blue line and a hot commodity for the 2012 NHL Entry draft in Pittsburgh. In round one, pick No. 2 by the Columbus Blue Jackets, he became the fifth Silvertip drafted in franchise history and the earliest to ever go. 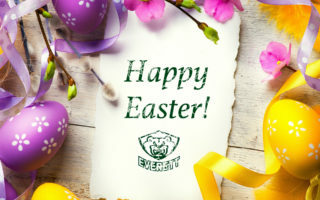 Only one spot behind top pick Nail Yakupov, Murray continues to make his mark on professional ice to this day and continually keeps Everett on the map for the future of professional hockey players in the Northwest. There are first round picks that we hold oh-so close to our hearts in Tips lore. NHL CAREER: In his rookie NHL season (2007-2008), Mueller put up a staggering 54-point performance. Following this performance, he was selected to play in the 2008 NHL Young Stars game in Atlanta, GA. After three seasons in Phoenix, he was traded by the Coyotes to the Colorado Avalanche on March 12, 2010. He made his Avs debut later that day, where he scored in a victory over the Anaheim Ducks. In only fifteen games with Colorado, Mueller surpassed the record he held in Phoenix the previous season. He continued on to play a short season with the Florida Panthers in 2012-13. WHERE IS HE NOW: After spending his 2016-17 season in the AHL with the Providence Bruins, Mueller now plays in Europe for EC Salzburg of the EBEL. NHL CAREER: Though he didn’t log many NHL games, Irving’s success is undoubtedly one for the books. After beating cancer as a child, he continued on to thrive in his career through blatant hard work and determination, completely deserving of his first round pick. Irving signed his entry-level contract with the Flames on January 18, 2007. He made his NHL debut against the Florida Panthers on December 16, 2011, after being recalled from the AHL a week and a half earlier. With 39 saves, he was named third star in the shoot-out loss and captured his first win on December 23 in a 3-1 victory over the Vancouver Canucks. WHERE IS HE NOW: After to agreeing to a one-year contract with he AHL’s Lehigh Valley Phantoms, Irving was traded to the San Diego Gulls to start the 2017-18 season. Irving completed his season in Southern California, his 10th season in the pros. NHL/PRO CAREER: After completing his 2007-08 season in Everett, Hamill was assigned to Boston’s AHL affiliate the Providence Bruins. He was recalled to Boston in the 2009-10 season and logged his first NHL point on April 11, 2010 with an assist against the Washington Capitals. He played three games in the 2010-11 season and was recalled to Boston for the playoffs, who later that season won the Stanley Cup. WHERE IS HE NOW: Hamill played professional hockey in Europe for six years, his most recent experience with Swedish club IF Björklöven where he logged 18 points in 29 games in the 2016-17 season. NHL/PRO CAREER: Following his time in the WHL, Beach made his professional debut in 2009-10 with the Rockford Ice Hogs. After 206 games in the AHL and 43 goals, he made his transfer to European hockey playing two seasons in the EBEL (Austria) with EC Red Bull Salzburg (2014-2016). After a seven-game stint in the ECHL, Beach returned to the EBEL, this time playing two seasons for the Graz 99ers. WHERE IS HE NOW: Beach played 44 games in the 2017-18 season for EBEL team Villacher SV, logging 22 points with nine goals and 13 assists. He had 84 penalty minutes. It was his 9th season in pro hockey. NHL CAREER: After concluding his 2012-13 season in Everett as captain of the Silvertips, Murray went directly to NHL ice. He played five seasons with the Columbus Blue Jackets, appearing in 264 games. The fearless blue liner hand 20 blocked shots against the Washington Capitals in the quarterfinals – skating in all six Stanley Cup Playoff games – and totaled 72 points in his time in Columbus. WHERE IS HE NOW: Following an injury that called for conditioning, Murray was assigned to the Cleveland Monsters, Columbus’ AHL affiliate, where he played one game and had one goal at the very end of the 2017-18 season. NHL/PRO CAREER: After nine games with the Worcester Sharks (AHL) to end the 2013-14 season, Mueller skated for San Jose for 39 games the following season. From 2014-2017, he went back and forth between the San Jose Sharks and their AHL affiliate the Barracuda. WHERE IS HE NOW: Mueller was traded to the New Jersey Devils for the 2017-18 season where he played 28 games. His contract with New Jersey extends to the 2018-19 season. NHL/PRO CAREER: Noah Juulsen began his professional career with the Laval Rocket (AHL affiliate of the Montreal Canadiens) where he played 31 games on the blue line. He was called up to the Canadiens and played 23 on NHL ice, logging one goal and two assists. He scored his first career NHL goal on Mar. 2 against the New York Islanders in Brooklyn. WHERE IS HE NOW: Juulsen’s three-year contract with Montreal continues through the 2019-2020 season and is a candidate for a full-time role with the NHL club.